Dr. Juji's essay｜Blood Banking and Transfusion｜Business and Products｜KAWASUMI LABORATORIES, INC. This is the essay on blood by Dr. Takeo Juji, MD, PhD who is Kawasumi’s technical advisor and a world authority on the transfusion medicine and cell therapy. This time, he presents an essay on the history of the blood program in Japan. Nov. 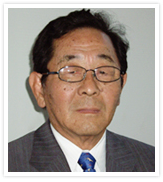 Assumed Technical Adviser of Kawasumi Laboratories, Inc.